Today is The “V” Word’s 4th birthday and it has been given the best gift EVER! A new home! Dave and Sian Graham of Vegan Web Design created and designed this beautiful web site for me. It was a lot of work especially working with someone like me who understood practically nothing about web design. I had bought a domain for The “V” Word over a year ago but it just sat there. The few times I attempted to do anything with it, I became so frustrated I nearly threw the computer out the window. When I mentioned my wish for a web designer on The “V” Word’s Facebook page, Sian said she could help grant me that wish and put me in contact with her husband, Dave. But look at the results!!! The “V” Word now has a beautiful new web page. Take a look around – the home page has an amazing slide show and featured blog posts. The “Check It Out” section will highlight a different person, sanctuary, charity or organization each month that I love and want to share with all of you. The “Resources” section has tons of information about where to buy ingredients, what books to read, what videos to watch, and which web sites to visit. The blog has its own page and all the recipes have been categorized so each one will be easier to find. Make sure you don’t miss any recipes or news. Subscribe to The “V” Word by filling in your email address at the “Subscribe” button in the right sidebar of the page. You will receive an email notification every time a new entry is posted to The “V” Word. Vegan Web Design: Websites with a Conscience is a wonderful company run by 2 wonderful people that I will consider friends for life!! Thank you so much, Dave and Sian!! 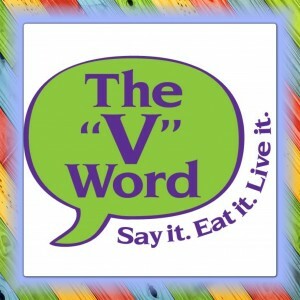 Now The “V” Word is more than just a blog, it’s a real web site for everything The “V” Word is and is becoming. And The “V” Word is becoming a lot more than a blog. 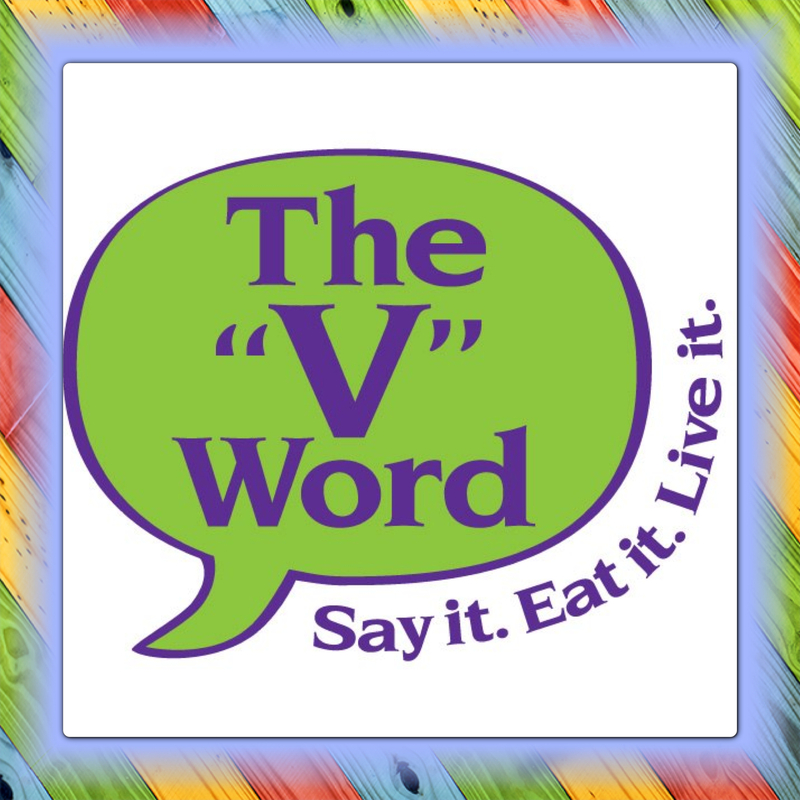 The “V” Word Cookbook will be available later this year. It contains over 200 recipes with full-color pictures. The proceeds of the book will be given to charities and organizations that help better this world. While you’re waiting for it to be released, The “V” Word Cookbook Preview is still available. The free preview is a 39-page e-book containing 15 vegan and gluten-free recipes including 2 never before posted. Speaking of never before posted, my recipes for V-Meat, V-Chicken and V-Sausages will be ready soon. They are in the final stages of testing and as soon as they are perfect, I will share them with all of you. They will offer an additional vegan and gluten-free choice to people whose diets cannot include seitan. Vegan MoFo is coming up in September this year. Vegan MoFo is the month of vegan food where hundreds and hundreds of bloggers dedicate their blogs to a minimum of 20 posts about vegan food for one month. This year, The “V” Word is doing an advice column called “Ask Dr. V.” If you have any questions related to vegan food and/or cooking, send them to info@thevword.net and use a code name like “Confused in Colorado” or “Gluten-Free in Glendale.” Senders will remain anonymous. If the idea goes well during VeganMoFo, maybe it will become a permanent feature of The “V” Word web site. In other news, The “V” Word name and logo have been officially trademarked so they are mine. Hands off! Seriously, if you aren’t talking about vampires or vaginas, The “V” Word name is taken! And finally, The “V” Word won the top spot on Skinny Scoop’s List of the Top 25 Vegan Blogs! Thank you so much to everyone who voted and made The “V” Word #1. You guys rock!! It’s hard to believe it’s been 4 years since I sat down and wrote my very first essay, “The “V” Word.” Thank you to everyone who has followed and supported me and The “V” Word. I love and appreciate all of you who have traveled on this journey with me. I’ve come a long way in 4 years but the journey has still just begun. I hope you will continue to keep me company as we move forward toward the vegan world we want and know we can have. Happy Birthday to The “V” Word! 15 Responses to Happy Birthday & Welcome to the New Home of The “V” Word! You’re welcome and may I say for anyone new to this blog, don’t try another vegan recipe until you’ve tried Rhea’s Moroccan Tofu in a Lemon Olive Sauce Over Spagetti. OMG, as they say. My all-time favorite. Congratulations on your “Birthday” and your move. The design has improved, but I know I can count on the same great content! CONGRATULATIONS RHEA on your great win…. 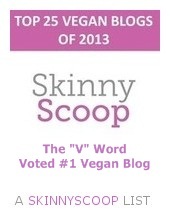 The “V” Word won the top spot on Skinny Scoop’s List of the Top 25 Vegan Blogs, Aug 2013! Rhea, Your new website looks amazing! I can’t wait to share it with everyone! Love the new clean look! Me too! At first it was hard to give up all the colors but this is much better. Thank you! Happy birthday V word, I am so excited about the new site! I’m excited too! Thank you Michele.